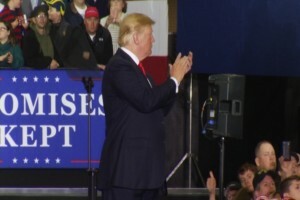 President Trump ended his rally in Macomb County Saturday with encouraging words for the crowd of his supporters. The president skipped out on the White House Correspondents’ Dinner and spent the night in Washington Township for a “Make America Great Again” rally. President Trump spoke for a little more than an hour and a half. He touched on a wide range of national issues, as well as things pertinent to the state’s election and Northern Michigan. 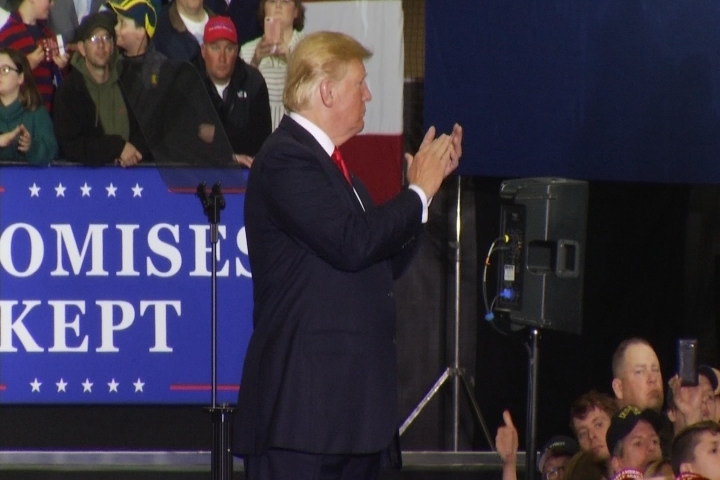 During his speech, President Trump said that a fix for the Soo Locks is long overdue. The president says he’s looking into what needs to be done immediately to fix the aging Poe Lock. One of those congressman is Republican Jack Bergman, who rode over with the president to the venue. Congressman Bergman says the aging infrastructure dominated the conversation. “After spending all that money in the Middle East, can you imagine? And we can’t fix a lock… we’ll get it fixed,” said President Trump. It was also clear that part of the president’s reason for stopping in Michigan is to increase Republican voter turnout in midterm elections.